Let me reiterate; if you see the ad below or any similar ad, run like hell. This is the absolute worst example of a Facebook Marketing Webinar that I have ever seen. I guess I shouldn’t be surprised because just like any other hot trend in business, there are those seeking to take advantage of folks and make a quick buck. I am just a bit surprised that it can happen so easily in the day and age of the self-educating buyer. I stumbled across this particular ad on Facebook and was so struck by the bullsh*t it preaches, that I was compelled to research, dissect and call them out. 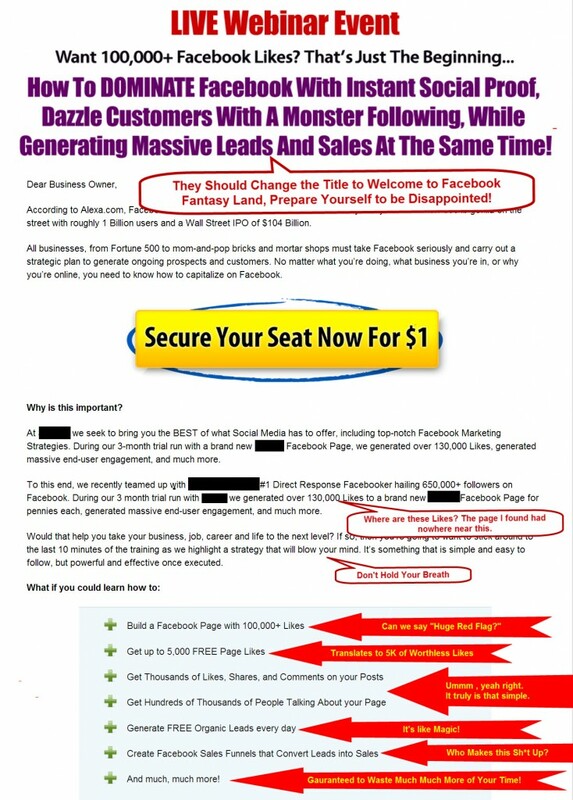 This is one of the biggest problems with social media marketing; scams like this claiming they can make businesses instantly successful with Facebook. Any well respected social media strategist will tell you right away that executing a successful social program takes planning, resources, a solid strategy, and most importantly, patience. Without further ado, let’s take a look at a frightening real world example of what’s wrong with social media training events today. Let me dive in a bit deeper as to why I take offense at their approach. First, they claim that they can teach you how to build a Facebook page with 100k Likes. Those likes mean nothing if these Likes are not from your target audience, and if they are not engaged or seeing your updates. I also have a problem that they are insisting a brand needs this many Likes to be successful on Facebook. The second claim of up to 5k free Page Likes is yet another huge red flag for me. Generating Likes for your Facebook page is not a commodity. You don’t give someone a gift of 5000 Likes; as a business or brand you need to earn these Likes and make sure the right people are liking your page. This is the best way to build a loyal following and see positive results. The next two claims are a couple of real gems. Get thousands of comments and thousands of people talking about your Page. One quick look at the Page of the company promoting this webinar will tell you that they are not practicing what they preach. Again, engagement on Facebook is a tough thing to achieve and at the end of the day, you shouldn’t prioritize quantity over quality. If you are looking for the real experts in Facebook marketing there are many to choose from. Just do your research and look for the ones who are not over-promising and overcharging. I recommend checking out Social Fresh, Blitz Metrics, Amy Porterfield, and Mari Smith just to name a few.